At our house, I’m known as the Hug Monster, my husband is the Zombie of Love and our littlest calls himself the Monster of Love. I’m happy I’ve recorded this fleeting nickname, because he’s already changing it to Love Man, inspired by all the superhero talk at preschool. I didn’t have ‘monster’ photos, so I grabbed some recent informal portraits. 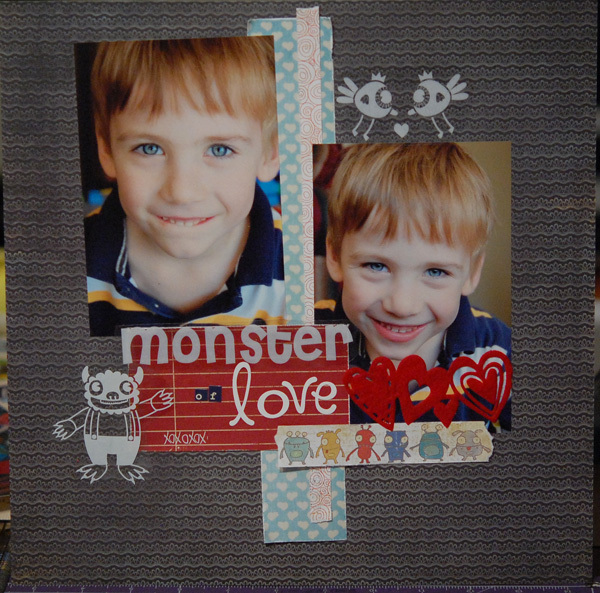 I’ve been loving the divided page design lately, so started with that as my foundation and just added a few monsters and hearts. Not a huge dent in my stash with this page since I used a lot of scrap bits, but I’m happy to keep it simple this time. Wow, your post helped me so much to really get a handle on LOAD. I’m unable to sign up for this round but definitely will join the next one. I am going to see how many layouts I can do this month! I haven’t done a layout is almost a year but did participate in the Ali Edward’s December Daily. After reading all the blogs I have decided to focus on layouts for my granddaughters and my family heritage album. Thanks for what you shared – it truly inspired me!! !